- Add 3 garbage bins. They are really CUTE, go and get them! - Game Center available, now you can play with barbequers all over the world. Let's find out who will be the best! Who will be the No.1 of World-BBQ-Tycoon! - To Encourage you tycoons, we added some gift packs for sale. Those who got higher scores in game will have chances to get a preferential price for some items. All those gift packs are unique and you are only allowed to get one of each pack, so if you found those gift packs in the shop, don't miss the chance. - 2 new grills for expert: Mecha-Age and Modern-Show. - Hidden stages found themselves hiding too deep to be found, so they decided not to hide anymore. - Reset is a very shy button, he doesn't want to be pressed by mistake, so he shrank and moved to a corner. - Optimized purchase process, you might find it takes less time than before. - Think it's too hard to play, even for the second stage? Well, that's not a problem anymore. We reduce the standard score for each level so that you can easily pass the level, even for a beginner. - And for those uber players, we made a real challenge for you: 2 new types of food to grill, 3 hidden stages, even our designer could not get rank S for all stages! Are you ready to become a true BBQ tycoon? - For more funny updates, please keep this game in your device and check update often. BBQ Tycoon is ascendantly ranked from sixth to third in the Free Golden List of China area. Have you ever try barbecue on your iPhone? 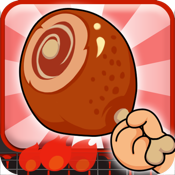 try this game, BBQ Tycoon will bring you an exciting game experience! You are about to grill delicious foods for a crowd of hungry people and make them happy. - Simple controls will bring you much fun. - The beautiful food looks so delicious! - Cute scenes, cute customers in game.